Bernard`s Landing, pools, The Landing award winning restaurant, Smith Mountain Lake Vacation Rentals - Sally`s Oasis - Lakefront - Smith Mountain Lake - Pools - Beach Bernard`s Landing, Franklin County short term rental. This beautiful town home at Bernard's Landing on the peninsula is ready for vacation memories!! Scenic views and elegant yet welcoming interiors make Sally's Oasis an incredible year-round destination. 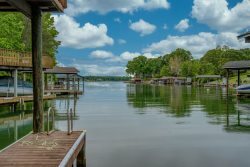 With hundreds of feet on the of shore Smith Mountain Lake, panoramic vistas across the waters of the mountain and a location only a short walk from all the amenities that this resort has to offer. This vacation rental makes it easy to play in the water or hike in the mountains. In warmer weather, take advantage of the waterfront setting by swimming off the dock, reading on the deck or soaking in one of the two outdoor pools! Linger in the evenings by the barbecue while watching the sunset. In cooler temperatures gather with family and friends in the home theater with a projection viewer. The interior of Sally's Oasis show what a comfy retreat can be. Open concept living and dining rooms make a refined setting for happy hour cocktails on the deck with incredible water views. The casual living area and a fully equipped kitchen is ideal for prepping snacks or chatting by the fireplace. Four Queen beds await guests to nestle in at night.